1. Homes in the 1950s often had more bathrooms (an average of 2.35) than bedrooms (1.5). 2. Buyers in the 1970s craved appliances in funky colors like avocado and harvest gold. 3. In the 1960s, the average home size was 1,200 square feet. 4. Average home square footage increased by 21 percent in the 1990s compared to the 1980s, but the number of rooms stayed the same. 5. In the '80s, the average number of televisions per household was 1.50, and the average listing price was just over $216,000. 6. In the '90s, the average square feet per home had nearly doubled from the '60s, moving up to 2,080. 7. By 2010, the average television per household jumped up to 2.93—that's just under 3 televisions per house. 8. Today, buyers seek homes with flexible spaces, connectivity between rooms and the outdoors, and opportunities for personalization. What will the next decade bring us? Experts forecast a heavier emphasis on technology and self-maintaining features. 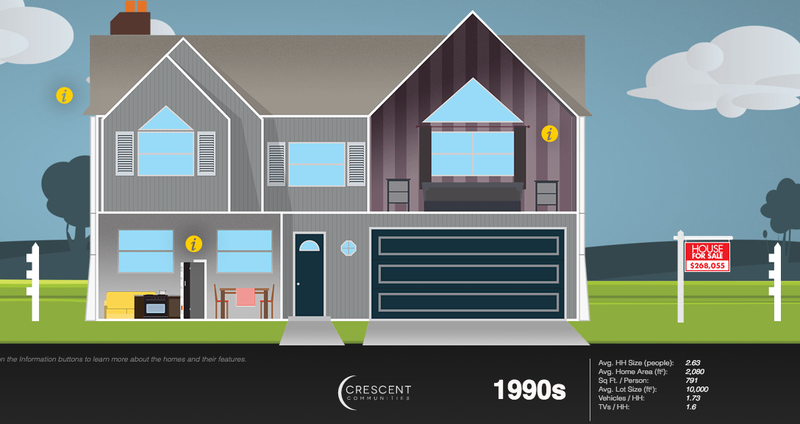 For more information on how home wants and needs have evolved over the decades, check out this infographic by Fielding Homes. Your number 1 and 2 above are turned around.. Colors were cravedin the 50s when houses had only an average of 1.5 baths. In the 70s, colors were out and more bathrooms in! I thought there were fewer bathrooms in the 50’s. Yes there were more colors in the 1950’s but the 1970’s brought Harvest Gold and Avocado green into being. My first house had Harvest Gold appliances! They didn’t mention that everyone wants Stainless Steel today. My, how appliance colors have changed over the years.